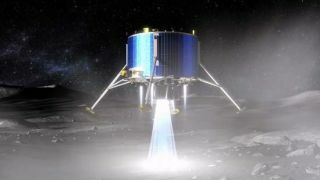 This artist's concept shows a proposed European Space Agency lunar lander touching down near the moon's south pole. Europe and Russia are working together to bring samples of frozen moon dirt to Earth in the next decade. The unmanned mission, called Lunar Polar Sample Return (LPSR), aims to bore into the moon's surface at either the north or south pole, where nearly permanent sunlight would allow a robot to operate in manageable conditions. "Scientists wanted a sample from the bottom of an unilluminated crater, but this would be practically impossible with the technology we have today," said European Space Agency official Bruno Gardini. LPSR is slated to blast off in 2020 or 2022, Gardini said. It would use drill technology developed for the European-led ExoMars mission, which aims to launch an orbiter to the Red Planet in 2016 and a drill-equipped rover two years later. Gardini expects some modifications to the ExoMars drill will be necessary for LPSR. And the moon sample will have to be frozen to minus 238 degrees Fahrenheit (minus 150 degrees Celsius), because lunar soil contains scientifically important compounds that will evaporate and be lost under normal temperatures and pressures. Gardini explained that it had been hoped that LPSR would be included in the ESA member states' meeting this November, which will decide the programs and funding for the next three years. But he said that discussion of the mission will now likely have to wait until 2015, when the next such meeting is held. LPSR should be considered as "a precursor for human spaceflight," Gardini added. A precursor mission to LPSR called the Luna-Resource Lander is also being discussed. This project, which is slated to launch in 2017, would test the visual navigation, hazard detection and avoidance systems, sample acquisition and in situ analysis technologies needed for lunar sample return. Luna-Resource was originally set to be a joint Russian-Indian mission, with an Indian rocket blasting a Russian landing platform and an Indian rover known as Chandrayaan-2 into space. Chandrayaan-2 may still be involved, but the mission will now be launched by a Russian rocket from Baikonur Cosmodrome in Kazakhstan. And the mission will have some ESA instruments onboard, agency officials said. The visual navigation and hazard detection and avoidance systems aboard Luna-Resource will also be used for ESA’s Lunar Lander mission, which is slated to launch in 2018. Lunar Lander will go to the moon's south pole. Gardini said a factor in ESA’s interest in the south pole has been NASA’s intention to place a future base there. The United States Congress has already declared that the base will be called the Neil Armstrong Lunar Outpost. LPSR would not be the first mission to bring moon samples back to Earth. Over the course of NASA's Apollo program, astronauts collected 842 pounds (382 kilograms) of lunar rock and soil for scientists to study.